We want to start with an announcement. We've been asked over and over to make MoS available as a book. So we're going to do it. We figure that it'll sell five copies, two of them to our mothers, but that's okay. At least it'll be a good-looking book that someone is reading. Within a few weeks, Book One will be available, covering the first half of the story. A while later, Book Two will be available. Watch this page for an announcement when the book is available. Or you can email mos@cinxia.com with a subject line of "Miracle of Science Book Update." We'll email you when the book comes out, and we'll toss your email address right after we send the email out, because the last thing the world needs is another damned mailing list. A note: Mars' final comment is a reference back to this page. The presence of one of Dryden's Marlowe robots is left as an enigma for the reader. Why would a little group-mind robot be happy at this point? Hmmm. I will also note that I was unable to resist ending with a boolean joke. Onwards: I'm not quite certain what to say at this point. The story I've been writing - and more importantly that Mark has been drawing - for years, is over now. Some people have asked if there's going to be a sequel. We don't have any plans for one, although I'm sure that one could be written. (MoS 2: Beatriz Juruna's Story?) But I'm not doing it, at least not any time soon. So this is the end. But there's another comic coming quite soon. Mark is working on the art design for the next comic, while I'm tweaking the storyline. Look for it at Afterlife Blues (which, at the moment, goes to a fairly sparse placeholder page). Now over to Mark, who gets the last word as is only right and proper. Thus begins one really weird relationship, and thus ends A Miracle of Science. 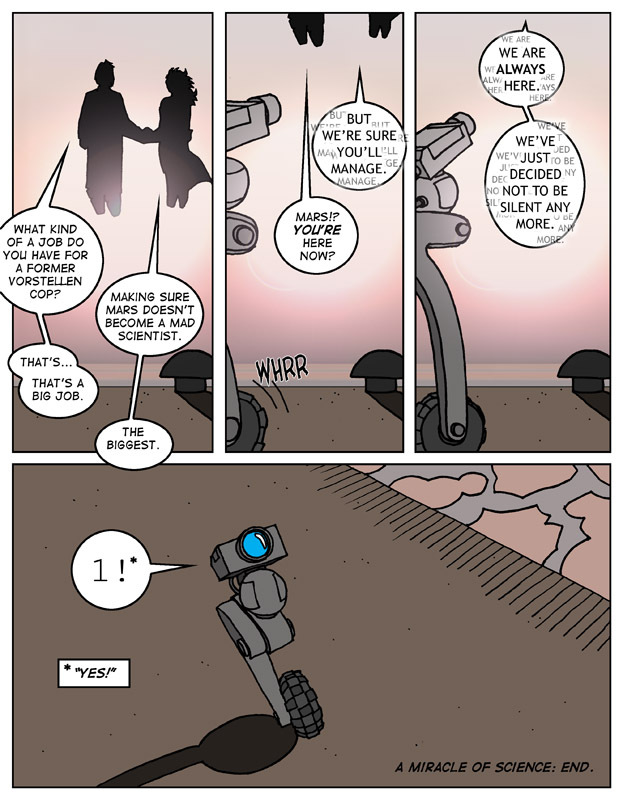 Fittingly, I only figured out how to draw the Marlowe robots correctly in the very last panel. So this is it! It's all over! Man, I don't know what to say even at this point, except a sincere thank you to all you many... thousands? Good God, that's more or less accurate... of people from all over the world who've dropped by on a regular basis to read the little Intertube comic Jon and I have been putting together. Seriously, you're too kind. Myself, I'm already looking forward to the next project... but first I'm going to sleep for a week. Our final, for now, fanstuff update is in the fan art page. It's cool, check it out. We'll have further updates in the future should the situation arise -- in general, feel free to drop in back here every now and then to see what's up. And of course, limiting myself to comics which are still running, there's longtime faves Elf Only Inn, Nekko and Joruba, Indavo, Gunnerkrigg Court, Everything You Know Is Right!, Vexxarr, Dresden Codak and Storm Corps. Oh, and what the heck, also Casey and Andy and Concerned even if they doesn't fall into the "running" category. If you read these comics (and have the exact same taste as me) rest assured you will be a happily entertained person.